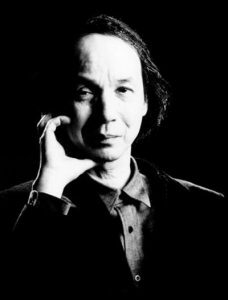 The venerable Japanese composer Toru Takemitsu (1930 – 1996) is best known as a serious classical composer, and, to a somewhat lesser degree, an innovative creator of music for film. Although largely unknown in the west, his work in the popular song medium spans most of his creative life, and includes music for theatre and stage shows, as well as theme songs for movies. In some cases he wrote his own lyrics, while at other times he set text by some of Japan’s most significant poets. In 2001, at the suggestion of NEXUS member Robin Engelman, we began a group project to create a body of percussion ensemble repertoire based on some of these pop-style songs. The resulting creative approaches turned out to be as varied as the personalities of the members of NEXUS themselves. The new repertoire formed a major segment on our concerts for several seasons, and was featured on the group’s CD Wings, released in the fall of 2007. I selected two songs for my contribution to the project – Unseen Child (Mienai Kodomo) and Wings (Tsubasa). I was attracted to Unseen Child because of its unusual and rather asymmetrical melody, as well as the haunting imagery of the lyrics – a poem by the beloved Japanese poet Shuntaro Tanikawa. I did not attempt to make an arrangement of Takemitsu’s song, but instead wove motives of the melodic phrases throughout my own composition, using a matrix of four non-transposable nine-tone scales – a system I had been using already in my own work for over ten years. The piece was completed in March, 2002 (now published by Keyboard Percussion Publications) and is scored for glockenspiel, songbells, vibraphone, marimba and six suspended cymbals. I arranged Takemitsu’s nostalgic song Wings for NEXUS in April, 2001. Takemitsu composed Wings in 1982 (also writing the lyrics himself) for a staging of Arthur L. Kopit’s play of the same name at the Seibu Theatre in Tokyo. It became quite popular in Japan, and has been recorded by several famous vocalists there. In 2001 NEXUS was invited by the CBC to present a joint concert together with the Kronos Quartet. For the occasion, I decided to expand my arrangement of Wings to include the quartet, and tried to make the string sounds colour the keyboard percussion, rather than the usual opposite approach found in most classical music. The concert took place on January 31st, 2002 in Toronto’s Glenn Gould Theatre. NEXUS’ Takemitsu project resulted in some fantastic pieces, including Russ Hartenberger’s wonderful Sky Ghost, a piece that later became the finale to a major four-movement work, The Invisible Proverb (recorded on the CD Drumtalker in 2003, and published by KPP). Robin Engelman was especially prolific, arranging at least half a dozen of Takemitsu’s songs for percussion instruments. All of Robin’s pieces are scored in surprising and inventive ways, and a great example is his version of All That the Man Left Behind When He Died (Shinda Otoko no Nokoshita Mono wa). The lyrics are again by Shuntaro Tanikawa. Robin, of course, was deeply interested in the “ancient” style of rudimental drumming, and he was able to incorporate elements of that tradition in his arrangement for this song. He asked me to play the elaborate snare drum part using one of my piccolo drums with calf heads. Robin himself played bass drum and cymbals.